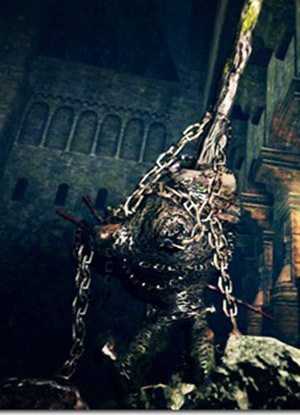 An enemy completely covered in chains that uses a spike protruding from its back and a ball attached to a chain as weapons. The chains around him will make your weapon bounce back, thus exposing yourself to his attack. Found guarding the elevator to the Chasm of the Abyss. Try using a heavy weapon held with 2 hands and you won't suffer knockback. Mind your stamina: you will need a lot to block some of his attacks. He's vulnerable to strike type attacks, so hammers will work. A good choice is Dragon Bone Fist because it's both fast and has a strike attack. Since you will encounter him in a great hall, there is plenty of room for you to roll around to avoid his devastating stone attacks. For a chained prisoner, he moves very fast. Best magic to deal with him would be Great Combustion or Wrath of the Gods, if you have enough to kill him. If you have Homing Crystal Soulmass and Crystal Soul Spear, charge up your soulmass first, then nuke him to death with your spears. The soulmass serves as a stun mechanism in case he gets too close to you, but also deals a fair bit of damage. Repeat until he dies. It will be a while. But it will be safe. Required: Ring of Fog, Slumbering Dragoncrest ring, and fast roll (mid-roll acceptable). Get close enough to the chained prisoner to agro him and lure him a short distance outside room he is contained in. Run back around him once he forgets about you towards the elevator shortcut but, do not activate it unless you want to deal with two enemies. Stay hidden in the passage to the elevator until he goes back to his post, facing away. Activate the shortcut and be glad he can't hear you.